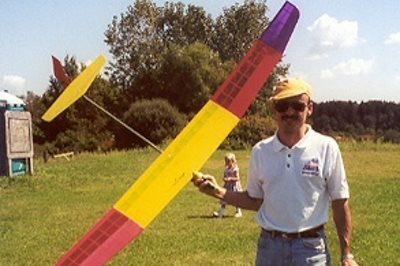 The Bubble Dancer is a 3 meter Rudder, Elevator, Spoiler (RES) radio control sailplane designed by Dr. Mark Drela of MIT. 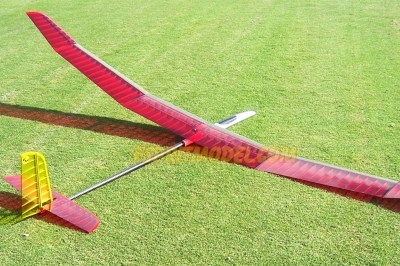 It features a very strong (full winch-launch capable) built-up wing that has a carbon fiber and balsa spar. 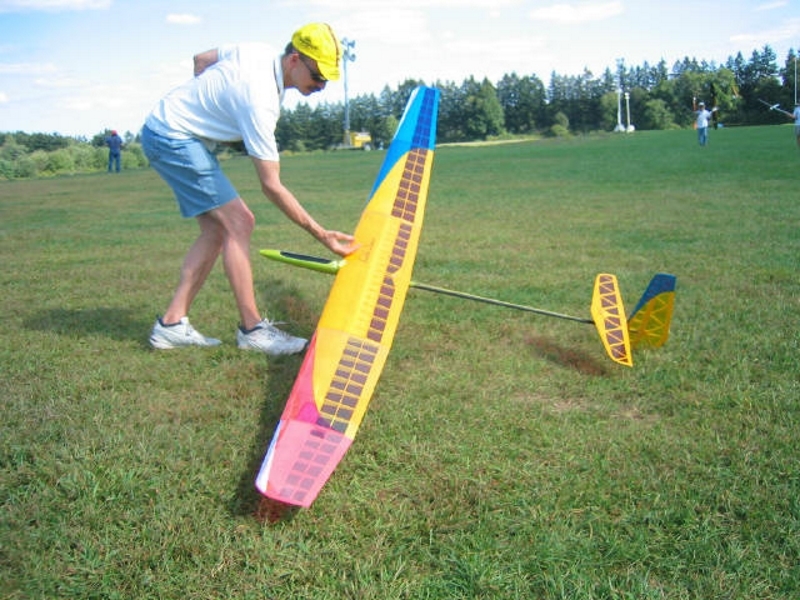 The plans for the sailplane are posted on the Charles River Radio Controllers (CRRC) website and can be found here. The Allegro Yahoo Group, serves as a discussion forum and document repository for the Bubble Dancer and many other Drela designs. The Bubble Dancer features a 5 panel polyhedral wing design, and utilizes the AG35, AG36 and AG37 airfoils designed by Dr. Drela. 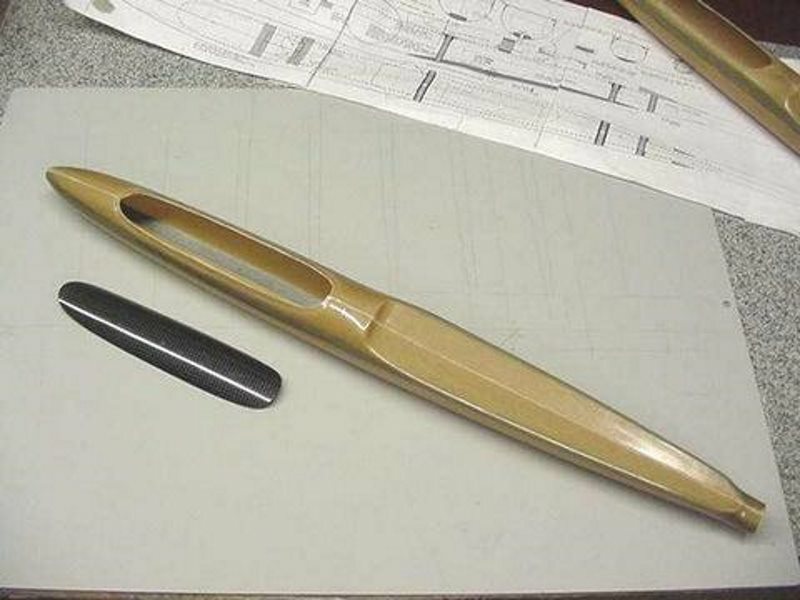 These airfoils are flat-bottomed aft of the spar to facilitate building-board construction. 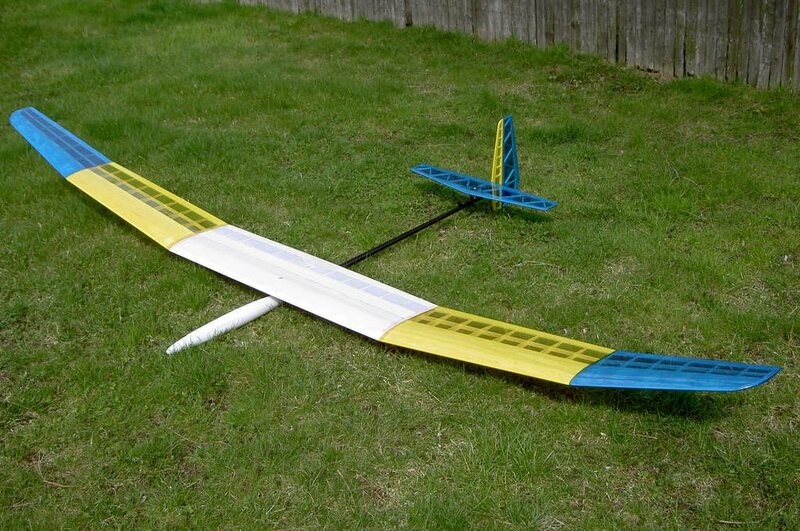 In fact, "All parts of the airfoil with open covering are flat by design." The idea behind this flat panel concept is that film covering is able to retain the airfoil's shape over a flat panel, thus ensuring airfoil fidelity where with other designs, the covering would sag. In this picture, I've highlighted the flat panel implementation. 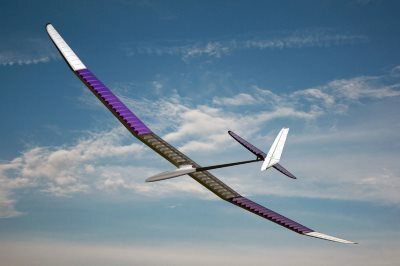 The Bubble Dancer can also be built as a composite wing airplane, in which case a differing set of airfoils, the AG24, AG25 and AG26 are specified. 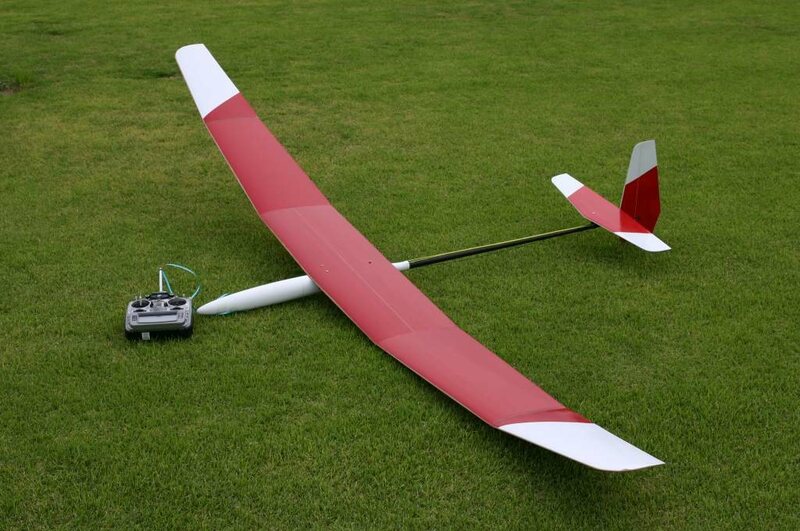 The CRRC website maintains a page listing, and explaining the various Drela airfoils, and can be found here. The Bubble Dancer pictured here is made with composite wing construction. I think that one thing that a lot of people who are interested in building a Bubble Dancer miss, is the fact that the Bubble Dancer is, in essence, a scaled up version of the 2 meter Allegro-Lite. The Bubble Dancer and the Allegro-Lite share the same airfoils and the wing design and construction is virtually the same. This fact is important for the simple reason that most of the discussion and documentation for the build methods used in building the Bubble Dancer will be found, not on the Bubble Dancer webpage - but on the Allegro-Lite's webpage. - AND in the Allegro Yahoo Group forum. 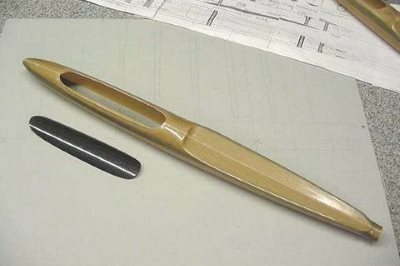 Since there is no "production kit" for the Bubble Dancer, a small cottage industry has sprung up around the production of parts for those wishing to build the plane, but the availability of these parts has fluctuated over the years. Typically, fuselage pods, tailbooms, v-mounts and ribs are the items that people will try to purchase rather than make themselves - the fuselage pictured here is one offered for sale by Bud Elder. Asking in the various forums, usually can generate a current suggestion of suppliers. The home-build nature of the Bubble Dancer has produced some interesting variations over the years. 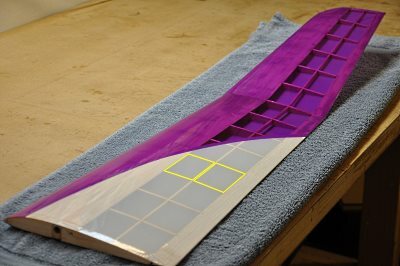 Usually the variation is limited to the shape of the fuselage but some experimentation in the tail section is also to be seen. A long-running thread on RC Groups shows some of the many Bubble Dancers that have been built. Several manufacturers have also developed virtual copies of the Bubble Dancer. 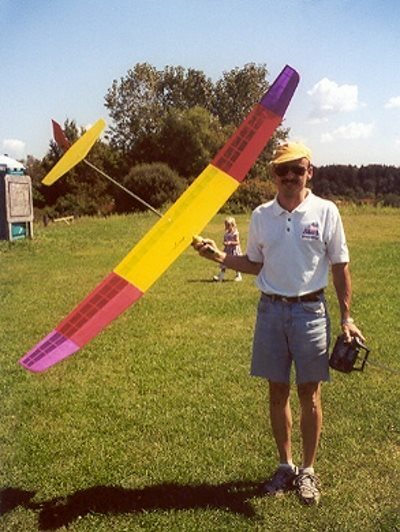 Probably the most famous being the AVA built by Vladimir Models and distributed in the U.S. by Kennedy Composites and in the U.K. by Hyperflight. 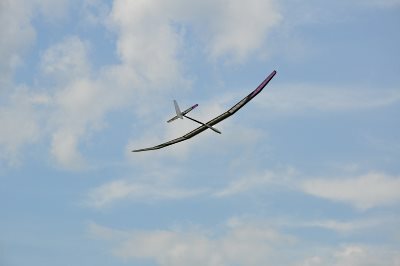 Of note with the AVA is the use of the composite Bubble Dancer's airfoils - the AG24, AG25 and AG26 airfoils in spite of it being a built-up wing. AVA variations come in extended wing and flapped versions. 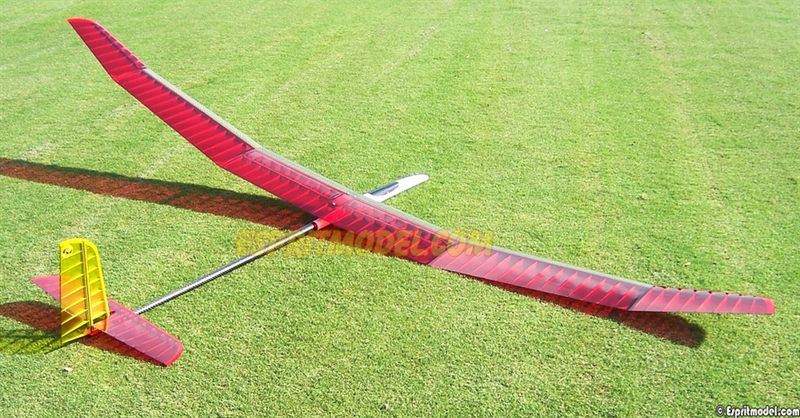 Another similar line of planes is the Pulsar Pro - available in 3.2 and 3.6 meter versions. 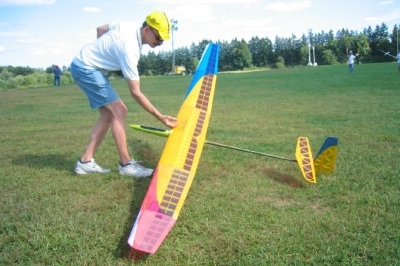 The Pulsar is available from several vendors including: Skip Miller Models, Esprit Model and SoaringUSA. 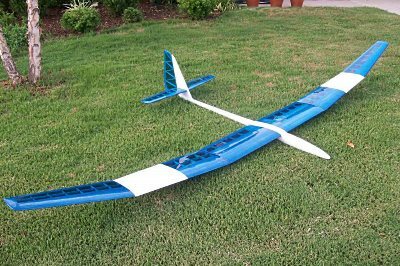 Because the AVA and Pulsar are so similar to the Bubble Dancer, many modelers who wish to build a Bubble Dancer have looked to these commercial models as a source for fuselages, tailbooms and v-mounts. This Bubble Dancer appears to be using one of the first generation AVA pod and booms. Note how the wing sits above the pod on a pylon. That gives you a quick overview of this sailplane called the Bubble Dancer. So how about you build one for yourself!